To begin painting plan your space. Have an area in the room where you can mix paint and keep all of your tools. Remove everything from the room and what cannot be removed from the room can be stacked in the middle of the room and covered with plastic drop clothes. Remove any lighting such chandeliers or light fixtures. Also, cover flooring before starting to paint. Taping down the plastic floor cloth is a great idea to keep from ruining carpet or tile during the painting process. When painting a room always start from the top and work to the bottom. That way you can correct any drips or splatters as you go. It’s always to best to start with the ceiling and paint large walls and such before trim. It leaves room to correct any roller splatter, stray paint brush marks, and over spray. ​Now after you have prepared your space and planned how to paint your room it’s time to prepare your space. Start by taking a scraper to any old or flaking paint. After lightly sand painted woodwork to take down any glossy surface to prepare them for new paint. Also, use a primer and sealer or using a higher quality two in one primer and sealer combination paint BEFORE repainting. 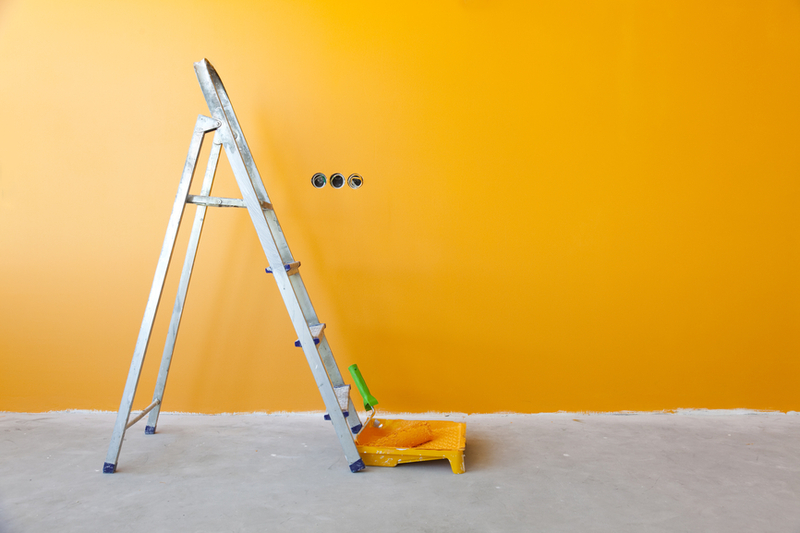 Inspect your walls for any chips, dents, cracks, or other imperfections in the walls before painting. To fix these imperfections use spackle or drywall compound. For larger imperfections cut away enough of the drywall or whatever material your walls are to be able to create a patch out of the proper material. For smaller imperfections a premade patch can be purchased. Finish by sanding so the imperfection no longer exists and the patch blends into the wall. Use a damp sponge to remove any dust from the repair. Time to start painting the large walls. The best tool to paint large walls is a paint roller. It puts paint on a larger area than a paint brush and the strokes are always even. This way less mistake are made and if there is a mistake made it is much easier to correct. Where a paint brush does not guarantee the same size stroke every time and makes it much easier for the painter to make mistakes. Paint brushes are to be used for smaller areas where a roller either cannot fit or where there is an angle where a roller wouldn’t do a sufficient job. Paint brushes are also used for my detailed areas of the room such as baseboards or around fixtures. Once the walls dry remove any painters tape that may have been used and if it gets stuck to any of the walls surfaces try a burst of hot air from a hair drier to loosen it up without damaging your newly painted walls. Always do the trim last! Starting with the trim closet to the ceiling and working your way down using the same system as when the walls were painted.